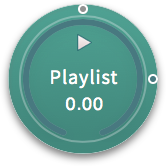 A playlist element allows you to play audio files in sequence, one after another. It works exactly the same way as an audio element, without allowing you to drag the waveform down the timeline. There is also no end time flag. ★ Pro Tip: Holding ⌘+Shift while dragging audio files onto a canvas from your finder window will automatically create a playlist element. You can add fades to all the tracks in the Crossfade All text box. Set the time to whatever you would like the fade length to be. This will also work on the audio element. You can convert an audio element to a playlist element in the options menu. There is a checkbox labeled Playlist. Simply check or uncheck to convert.